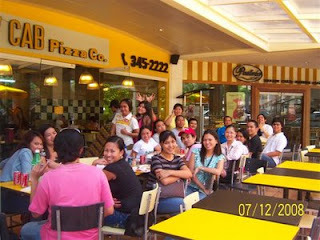 Name of Establishment: YELLOW CAB Pizza Co.
Other branch: Mango Avenue Branch. We’ve been an advocate for pizzas and we usually have Yellow Cab Pizza Co. deliver it for us to our office. One call away and after 45 minutes, the group can now dash in for the pizza! As to their company motto: “When you want great pizza. Call a Cab.” Well, we did call them! Tell me what’s yah flavah! They offer Classic Pizza, Specialty Pizza and some extras. -Roasted garlic and shrimp * I love this! -Coke products, SOLA Bottled Ice Tea, and Bottled water. Their Coke 1.5L is available for delivery only. 18” – Huge size (good for 8) or group of parties! -You can have it like the regular pie cut or criss-cross (small squares). It depends on the sizes you ordered. As of this note, it ranges from P 225 to 735. Just give them a call and inquire. Prices might change! For a team with 16 members, you may spend P2k for it including drinks! There you go guys, I know, you might be craving for it! At least you have an idea in mind what to order! Thanks to me! Hehehehe. ;) Go, call a cab! 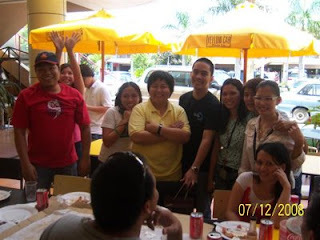 Yellow Cab! Yellow cab and all ideas of the success have been done for the humans. The improvement of the business and edubirdie.com review is demarked for the individuals. All the issues he been done for the profiles and its items for the humans.